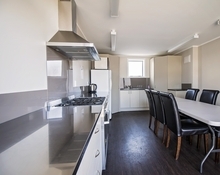 A good size kitchen with full cooking facilities. Well suited for group stays. The Studio suite has queen size bed, lounge furniture and desk. The unit has an ensuite bathroom microwave, coffee/tea making facilities, cooking facilities, 32 inch TV with freeview and Sky Sleep 2 persons. Tariff: $120 sleeping 2 persons. 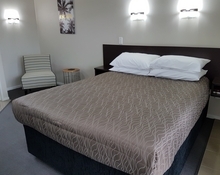 Twin Studio Suite has queen and single bed in the same sleeping area. 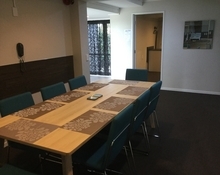 All units have 32 inch tv with freeview and sky, free unlimited Wireless Internet available, microwave, tea/coffee making facilities,and cooking facilities , wall mounted heaters and large ensuite bathrooms. 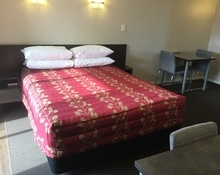 Units sleep max of 3 people. Tariff: $120 for 2 persons. $20 extra person. Our 3 bedroom unit is wonderful for teams or families it consists of a full kitchen and 2 showers/ toilets. The 1st bedroom has 4x singles and room 2 has 1 single and room 3 has a queen bed and a double bed. It has a 46 inch Tv and the dining area can seat up to 10. This unit is located at the back of the complex and is single storey.GREAT UNIT. Tariff: from $225.00 sleeping up to 4 persons. $20 each extra person. The One Bedroom Executive Suite has a double sofa bed in the lounge area and queen bed in the bedroom. These units also have full cooking facilities, coffee/tea making facilities, microwave, 32 inch Tv with freeview and sky. There is a shower in the ensuite bathroom. Lounge furniture and dining room table and chairs. Sleep 4 persons max. Free unlimited Wifi. Ideal for couples wanting the extra space. Recently refurbished. Tariff: $145 sleeping 1 or 2 persons. Extra person $20 each. 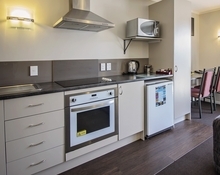 Apartment is fitted out with 2 bathrooms, 2 LCD TVs, dining table and chairs, 1 queen-size bed and 2 single beds. Free unlimited WiFi access. Cooking facilities. 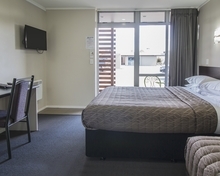 All rooms recently refurbished. Rate is for 4 persons. Single trundle bed available. Tariff: $195 for 4 persons.